If you’re interested in learning how to grow organic food, I have some tips today. Admittedly this post is a little bit all over the place, but hopefully there’s something in here that will be useful to you. The video is worth watching, and at minute 3:57 I explain the ‘3 sisters’ that I was planting in the video last week. Hey guys it’s Phil from Smilinggardener.com, if you haven’t picked up my free online organic gardening course you can do that right on the home page of Smilinggardener.com. Today I’m talking about growing organic food. Just kind of some odds and end tips on how to set up your food gardens. I’ve kind of been talking about it throughout this series, but now I just want to share a few other things. Here I have part of my food garden right behind me. A quick first tip is grown the things you want to eat. You might notice here I have a bunch of brassicas: cabbages and broccolis. A lot of people don’t like eating that, I do so I plant a lot of that. But if you don’t – save that room for something else! So just start with what you want to eat. Another tip is on the size and I always suggest that people start with very small ones when they’re just starting. Even if you just have a hundred square feet which is perhaps what I’m showing on camera here. You can grow – I probably have 20 different kinds of plants here: many different herbs, different brassicas, different – I even have a few tomatoes right here, lots of different flowering plants that are bringing in different beneficial insects, strawberries – I have a whole bunch going on in a very small area. And what that means is that you can really do a good job if you just take 10-15 different species of plants, plant them in a small area, really take care of it well you’ll do a good job. The next tip is to plant some annual plant, that means most of our vegetables especially in a temperate climate are going to be annuals so potatoes, and tomatoes and cucumbers and a lot of these vegetables we really love to use. Go ahead and plant them. Now, the other tip though is – the one thing I don’t love about annuals is you have to plant them every year. The other side of that is to plant perennial plants which means you just plant them once and they come back every year like this cherry tree here. I’m standing here in my forest garden – my very young, very new forest garden, I’m going to make a video for you about that shortly. And what that is, is we focus on nut trees and fruit trees and shrubs and other plants that just come back every year. Including some vegetables, I’m excited to get some asparagus going in here at some point, some lovage and then also self-seeding plants like dill (actually you saw in that garden) there’s dill in flower right now, there’s cilantro, those are going to come back every year from seed. So this is kind of a permaculture concept, this idea of just planting for the longer time. Planting more sustainably so that the garden eventually just takes care of itself by just growing every year as a perennial plant or as self seeding annual plants.What you can do in the meantime is another principle which is get a yield. You want to have food this year, that’s where the annuals come in and it’s fine to do some of them. You’re back into your potatoes, tomatoes and those thing we were talking about. And I’m doing that in this garden as well for now, while there’s lots of sun in this garden. I can…you may be able to see in the background there’s trellis’ I can grow tomatoes, and cucumbers, I have a bunch of little things I’m sticking in here, and then gradually the perennials will take over and this garden will become very hand off for me. Back talking about vegetable garden, because I know that makes sense for a lot of you, I have a few tips on that and the first one is about crop rotation. Here’s this bed that I planted about 3 weeks ago (I’m going to talk about that in a second), it’s corn, beans and squash in here. Last year: different plants. Last year I had mostly tomatoes in here. Rotating your crops is a good idea. What that means is planting each plant family in different beds each year and maybe you have like a 3-year rotation or could be much more like a 7-year rotation where they’re not going in the same spot every year. Primarily what that’s good for is it’s going to kind of confuse pests so that if your pests…if the predators of your tomatoes set up shop in the soil over winter and they come up and those tomatoes are elsewhere – that’s really going to confuse them a little bit. Also there can be some benefits to different plants taking up different nutrients from the soil, especially important when we have these kind of imbalanced soils that so many of us have. Another one is companion planting and that’s when you plant different plants together. So instead of you know – one of the big problems with industrial agriculture is we have these huge monoculture crops of corn and soy beans. In the garden, we can plant different plants together and they’re going to often provide benefits for each other, or at least just take up different niches in the garden. Mostly what I often like to do is what’s called more of a polyculture. Whereas what I showed you at the beginning of the video that bed probably had 20 different species of plants all really mingling together, all interplanted, and that’s going to be a huge amount of biodiversity it’s going to confuse pests, it’s going to really use the garden efficiently by having different heights. This is a meso-American tradition of planting corn, beans and squash together. There are various different ways of doing it depending on the geography and things like that but here’s how I’ve done it. I plant little clusters 3 feet apart throughout the garden so there’s lots of space in between them. In each cluster goes corn. You can seed corn direct, that’s fine. You wait until it gets about 4 inches tall. I put 4 corn in here. Then, you come and plant a bean by each corn. And what happens is, the corn is going to act as a trellis for these beans. So here’s the corn, here’s the beans. So, the corn gets tall, the beans (these are climbing beans) “pole beans”. They’ll climb up the corn, so that acts as a trellis. There’s other benefits. The corn actually exudes through its roots food, for the nitrogen-fixing bacteria that reside on the beans. Of course the beans also house this nitrogen-fixing bacteria. The thing that’s cool about this is corn needs a lot of nitrogen, so there’s a trade going on here between these two. I planted a squash, the big thing about the squash is it’s going to spread out. Now I think this one happens to be more of a bush-type squash, but I have other squash in here that are vining squash so they crawl throughout the garden, they stop….they decrease evaporation from the soil, they control weeds by having these big leaves that spread throughout the garden. So they’re helping too. So they all kind of help each other. So read on down below, I usually put a little bit more detail in the article and you can ask questions down below about anything having to do with setting up a food garden, just designing your food garden, crop rotations, companion planting, polycultures, annuals vs. perennials, things like that. Also, you can pick up my free online course down below or you can go over to Facebook.com/smilinggardener to come out there. We post stuff over there every day, and I will see you next time!! Not too big. This is an important one. I say even just doing a good job with 10 different kinds of plants is much better than struggling with 30. You can grow a decent amount of organic food if you intensely plant 100 square feet, and it won’t be overwhelming. The biggest time investment is usually in spring, when you amend the soil, optionally start seedlings, and plant and sow your beds. Then comes summer time when you can end up with loads of the same kind of fruits or veggies at once, so you need to be ready to preserve or share them or they’ll go to waste. If you start small, you can keep on top of weeds and watering and fertilizing and really pay attention to everything that’s happening in the garden, rather than spending all season scrambling to keep up. Some approaches to growing organic food have a long-term outlook, while others are more focused on immediate results. Annuals like tomatoes and cucumbers are more for the short term. They’re definitely a real treat, and they’re mainstays of an organic vegetable garden, but they do have to be planted every year, and they need some attention throughout the growing season. A problem I sometimes run into, what with me not actually living where my garden is located, is that some of my annual plants struggle because I may plant them and then be gone on an adventure for a month. 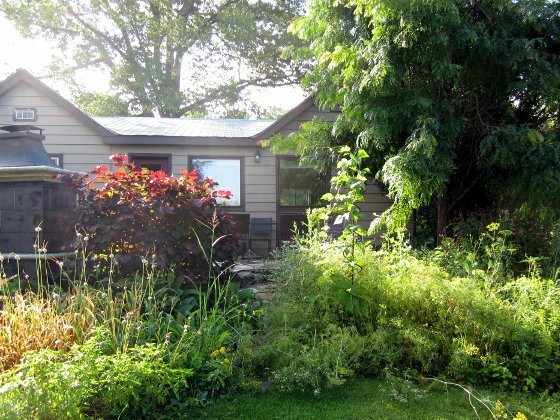 Permaculture emphasizes using long-term strategies to grow organic food-producing gardens that largely manage themselves after initial setup. This approach focuses on fruits and nuts, perennial veggies like asparagus and lovage, and perhaps self-seeding plants like Russian kale and self-seeding herbs like dill and cilantro. This is appealing to me because once these plants are established, they largely take care of themselves, and the weird weather we often have (too wet/dry, too hot/cold) doesn’t have as big of an impact. We usually want to get some organic foods from our gardens right away, which lands us in the realm of traditional annual vegetables like potatoes, lettuce, etc. You don’t have to choose just one approach – just find a balance that fits your situation. Some of the first things to take care of in the garden are water, access and structures. In fact, there’s an acronym that sometimes gets thrown around in permaculture called W.A.S.P. Water. Preferably more than 1 good water source near the garden. Access. Easy foot and wheelbarrow access anywhere you might need it. Structures. A potting station, a compost zone, areas for storing amendments and tools, etc. Plants. Then you can get excited about growing organic food. It’s essential that the garden space meets the plants’ needs for sun, water, and soil type. Most annual vegetables require full sun in temperate zones. If you have many shady areas, you can cross-reference a few online lists of more shade-tolerant food plants. While conventional farming relies on monocultures, there’s no reason we need to do that in the garden. If you grow organic food plants in combinations, it can improve yield, soil health, and biological diversity. This can start with something as simple as crop rotation, where we plant different crops in a bed each season, making sure to wait at least three years before planting something from the same family again. It’s mostly agreed that this reduces disease pressure and lets the soil regenerate, as each plant has unique nutritional requirements. Taking it further, we can combine different plants within the same bed. Companion planting mixes plants that actively support each other. A well-known example is the traditional Meso-American ‘3 sisters’ combination – corn, beans, and squash – which I planted this year. 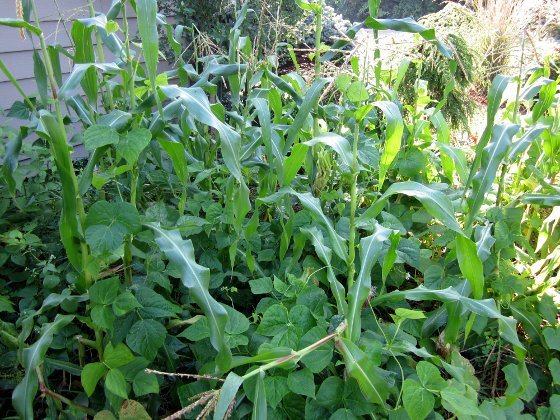 The corn provides a trellis for the beans and food for the nitrogen-fixing bacteria. The beans house those bacteria, who fix nitrogen for the nitrogen-hungry corn. The squash shades the soil, controlling weeds and decreasing evaporation. There are many guides out there on companion planting, but they don’t all agree with each other as to which root crop loves which leafy green, so you may do just as well by experimenting. I sometimes just mix 10-20 different plants in a bed, including growing organic food plants along some beneficials like wild marigold, nasturtium, and bee balm. This is called a polyculture. Any questions about how to grow organic food? Let me know below. What are you most excited about growing this year? Great video thank you. I am learning a lot from you. My question is, now that I have my Spring garden in, I’ve discovered there’s a pest in there munching the leaves of my veggies. I think it’s sow bugs. What’s the best, and safest way to rid of these pests? Love it! Thanks Phil – where can i find more which fruit/veggie plants work best as “companions”? I only have an L shaped raised garden bed that is 12′ on one leg and 16′ on the other. I also scatter plants in different parts of the beds in an effort to companion plant things. So rotating crops would get quite complicated and would probably be the difference in a foot or two if I planted something in a different place. So how much sense does it make to try to rotate crops in such a limited amount of space? Good question. It may or may not make a big difference in such a small space. Perhaps best to just create great soil and not worry about rotation.